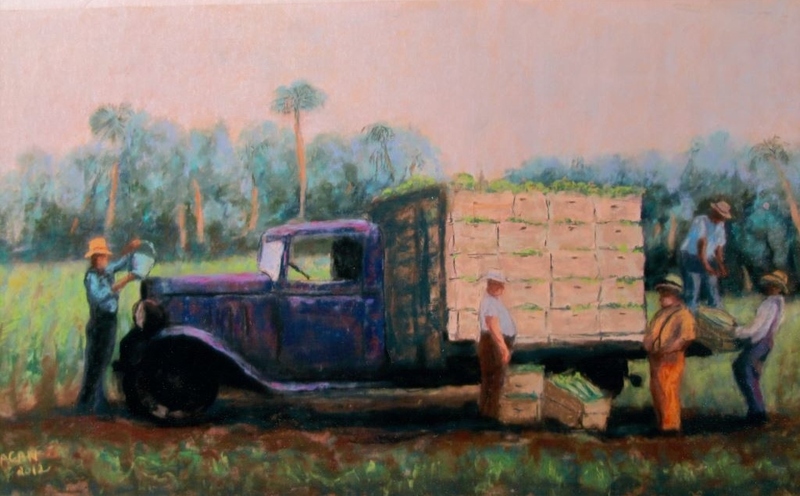 A painting by Bettye Reagan, a local artist in Central Florida, inspired by a photograph of farm workers loading celery onto a truck in Slavia, Florida. Slavia was established in 1911 when the Slavia Colony Company purchased about 1,200 acres of land west of Oviedo. The earliest settlers of the community came from rural areas in Central Europe who were attracted to Florida's warm climate and rich soil. By the mid-1920s, celery became Slavia's leading cash crop. Original painting: Reagan, Bettye. Duda Celery Farm. 2004: Private Collection of Bettye Reagan. Digital reproduction of original painting: Reagan, Bettye. Duda Celery Farm. 2004. "Loading Celery." RICHES of Central Florida. https://richesmi.cah.ucf.edu/omeka2/items/show/6935. Originally created by Bettye Reagan. Copyright to this resource is held by Bettye Reagan and is provided here by RICHES of Central Florida for educational purposes only. Petrik, Robert. "Czechs and Slovaks in Florida." American Czech-Slovak Cultural Club. http://acscc.org/Papers/svu_062703b.html. Reagan, Bettye Jean Aulin. 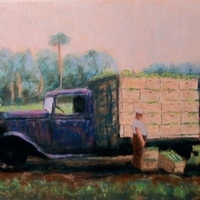 “Duda Celery Farm by Bettye Reagan.” RICHES of Central Florida accessed April 26, 2019, https://richesmi.cah.ucf.edu/omeka/items/show/6936.